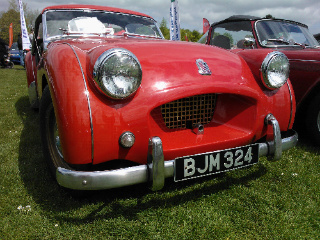 The Triumph TR2 sports car. 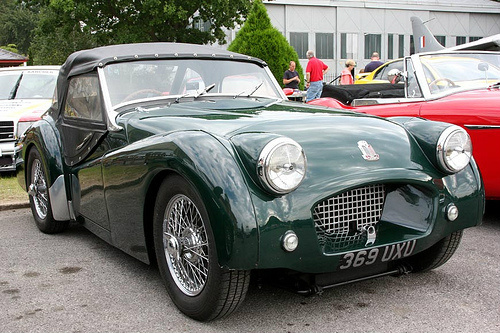 At its roots, the brainchild of the TR2 was Sir John Black, the MD of Standard Triumph. He had already made a bid for the Morgan Motor Company, and duly failed. He watched with unease as Jaguar continued to increase its share of the sports car market, whilst using engines supplied by Standard. However, he noticed that, in terms of price, there was a gap in the market between the sectors dominated by the expensive XK120 and the modest MG T-series. He decided to exploit this gap with a sports car of his own. 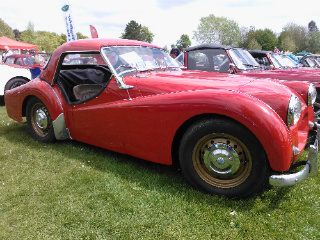 Although Standard Triumph had the Triumph Roadster, it was no match for the Jaguar XK120. He then set about creating the prototype, which was to be designated the Triumph 20TS. The engine displacement was reduced from 2.1 to 2 litre in order to conform with racing regulations. Two SU carburettors were used together with a high lift camshaft, and the compression ratio was increased. 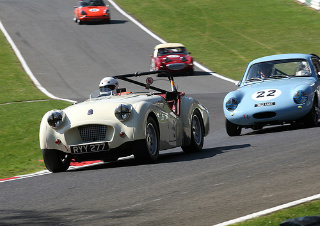 This produced a 90 bhp unit which meant that the TR2 was now capable of the magic 100 mph. Instead of using metal stampings, curved body panels were welded together. The grille consisted of a simple mesh set into a deep recess. This provided a simple means of distinguishing the TR2 from the later TR3. The steel body was fixed to a substantial, separate chassis. Plastic side screens were used in place of wind up windows. 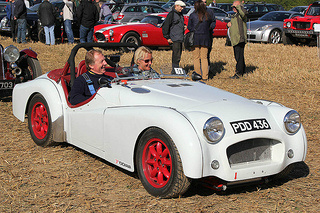 The two seater TR2 sports car used a four speed gearbox, whilst overdrive on top gear only was available as an optional extra. All wheels were fitted with drum brakes. The fixed headlights, reminiscent of the Mark 1 Austin Healey "Frog Eye" Sprite, were in place of the originally specified retractable ons. 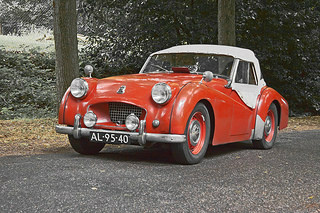 Having been heavily criticised after its initial launch in 1952, further development work was put in place when, in 1953, the reborn Triumph TR2 was presented at the Geneva Motor Show, to rave reviews. In 1953, of the 248 TR2's built, 198 of them were exported, primarily to the US. Furthermore, all these exported models, together with the first 4,000 units produced in 1954. were of the long door variety. This meant that the doors extended right to the edge of the car. In the latter part of 1954, a shorter door version, with body sills under them, became the norm. The TR2 quickly became established due to the fact that it was rugged, relatively inexpensive, and had excellent performance. This limited edition TR2 was built by Imperia, near Liege, in Belgium. The factory was founded in 1906, and built Standard Vanguards, Alfa Romeo's, and Triumphs under license since 1948. 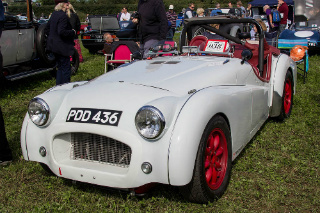 This unique TR2 was powered by the 1991 cc, straight-4, but developing a higher 100 bhp. They were produced for just one year, from 1954 to 1955. Only 22 units were built, of which three were the long door version. It is estimated that only 17 of the 22 still survive. 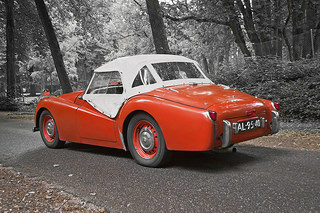 The Francorchamps TR2 was a fixed head coupe with a special plexi sunroof that could be tilted open. It was the forerunner of the Targa and Panoramic roof. The car was quite noisy, and had a tendency to get rather hot inside, and so an easily opened sunroof was a boon. 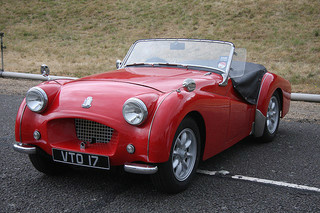 This particular model was intended to be a delux version of the TR2, with windup windows instead of plastic side screens. Optional extras included overdrive, wire wheels, a two speed wiper, and a special wooden steering wheel. The name Francorchamps referred to a nearby motor racing circuit. 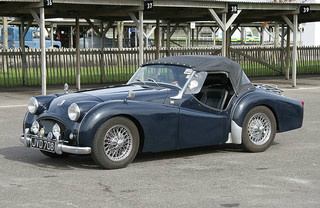 A 1954 Triumph TR2 sports car, in excellent condition, can command as much as £32,000/$51,000.